This month we review a selection of movies from Empire’s 100 Greatest Movies list. 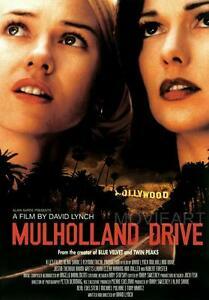 Today is Number 74: Mulholland Drive. All the ingredients seem to be there for a fantastic mystery thriller. A girl with amnesia, a keen wannabe actress, the mob, a movie director being blackmailed into casting a nobody and a mysterious cowboy. There are loads of great characters, immersive scenes and a story which you can’t help but get caught up in. That is until David Lynch went and David Lynch’d all over the ending. This is particularly infuriating because of how invested you become in the movie and the mystery at it’s core. Lynch actually crafts a conspiracy that you can sink your teeth into to. Laura Harring appears in Naomi Watts new apartment as an amnesiac and part of the movie is piecing the Harring’s identity back together. This involves mysterious cash, the name Diane and enough tense scenes of discovery to keep you engaged. Add to this another story involving mobsters who are blackmailing director Adam, played by Justin Theroux. His life falling apart in one very unfortunate day is also as compelling and you try your best to look for the clues which piece the two seemingly unconnected tales together. There are moments that they do connect and part of the engagement of the movie is working hard to solve the conspiracy before the two central characters do themselves. Of course, being David Lynch, there are also plenty of red herrings. Some scenes seem so random and so disconnected that you wonder if they were placed as more of a distraction than a helpful clue to unravelling the mystery. The movie never seems too distant though and although you have to think and engage throughout, it feels that the mystery is worth solving. Which is why it would be infuriating if the movie didn’t have a proper conclusion. The moment that Harring and Watts go to a club call Silencio, the movie goes full Lynch and loses all of the positive elements it had before. From this moment the movie makes little to no logical sense. Characters change name, direction and relationship altogether. The mystery and conspiracy evaporates and the story disappears. Even attempts to make sense of the new direction the movie takes get thrown out the window. There seems like a logical solution, which wouldn’t be satisfactory for all the build-up but would at least leave you feeling like you hadn’t wasted your time and investment. Unfortunately, Lynch manages to throw fuel on this and set it alight with a strange final scene that is as baffling as everything else. When the final credits roll, you can’t help but feel dejected. There is nothing wrong with a movie which plays with convention and has a stranger, more unusual way of telling a story however what Mulholland Drive does is over-complicate for the sake of it. It isn’t that it lacks a helping-hand or even that the audience need one, just that Lynch seems to lead you blindfolded into the middle of woods and then leave you with no map, torch, tent or clothes! Lost and annoyed. Overall, the first two hours of Mulholland Drive are compelling and engaging, crafting a mystery which you can’t wait to solve. Unfortunately, the last thirty minutes ruins the movie, with a cryptic, complicated and baffling change to the story and characters that isn’t clever but just self-indulgent.